Take a little bit Marble Madness, throw in some tower defense gameplay and add a quirky sense of humor, and you have Rock of Ages, one of the more unique titles to come out this year. 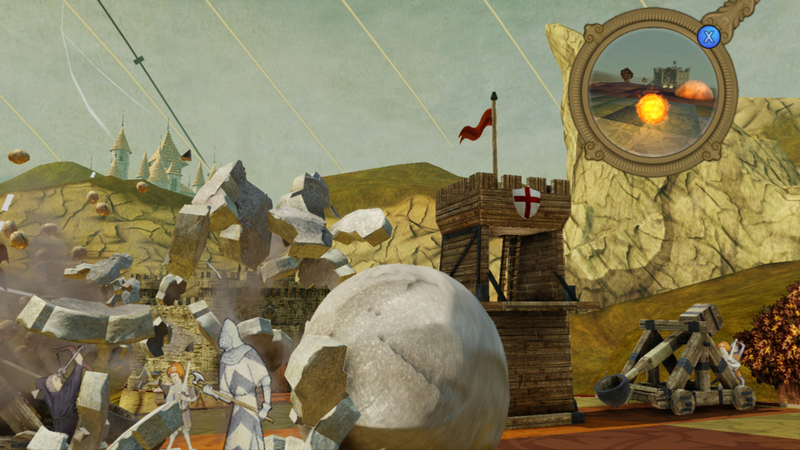 In the game, you control a giant boulder with your goal being to race through a course and then smash through your enemy’s gateway at the end. Your opponent’s goal is the same. The catch here is that both you and your adversary also have the ability to build up defense mechanisms to slow each other down and/or destroy the boulder itself. At the beginning of a match, you are given a decent amount of cash to spend on defensive units that range from catapults to towers to cattle/elephants. You can earn more money by obliterating your opponent’s buildings while you are racing through the course. It is important to do all of this as fast as possible since your enemy is doing the exact same thing on their end. The idea is to load up on defense in a way that will make it difficult for your opponent to get through. This is easier said than done. In fact, most of the time these strategic placements do little more than create a small nuisance for each boulder. It takes some real maneuvering (or just plain luck) to trip up your opponent on most courses, so ultimately these contests become more like full-on races against the clock than anything. Still, it’s fun to throw a bunch of diversions at the enemy while hoping they slip up now and again. The game’s single player campaign has a little over 20 missions with a few boss battles included to spice things up. There is enough variety in course themes and design to keep things fresh throughout. I loved nearly all of the courses, and there was a good blend of challenging platform areas and fun levels designed to allow the boulders to maneuver at a fast pace. Just as much focus was placed in the game’s multiplayer features, which is where the replay value really lies. This can be played online or via local split-screen, and it includes a unique mode that is perhaps most enjoyable of all: SkeeBoulder. As the name would suggest, it plays out like everyone’s favorite arcade game, Skeeball, with the addition of point multipliers as well. It’s fun and quick, and perfect for multiplayer action. Rock of Ages is light-hearted in tone, and all the better because of it. 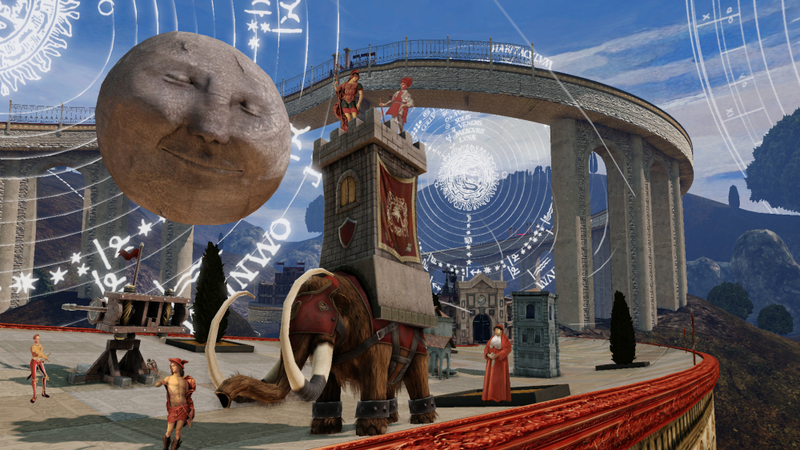 In the single player campaign, cutscenes are whimsical in nature and often parody various historical and fantasy figureheads. Two of my favorites happen early on, in the form of nods to Lord of the Rings and Castlevania. This is a game that doesn’t take itself seriously at all, frequently including random fart noises for the hell of it, but it somehow works for the game’s atmosphere. 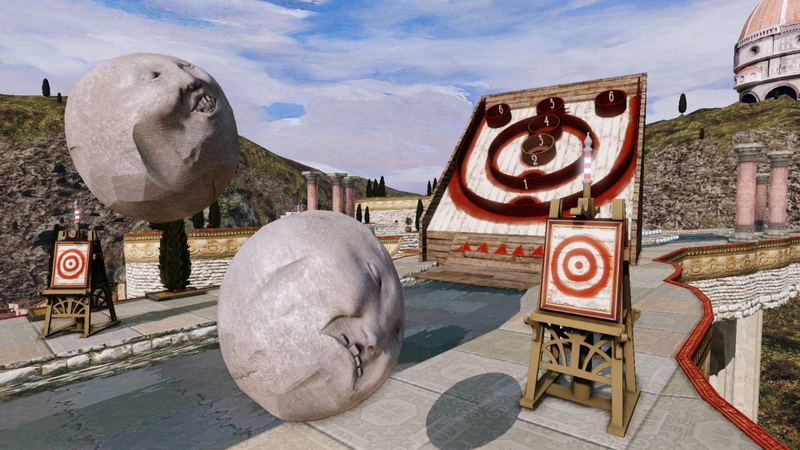 This sense of humor translates into the game’s visuals as well. The paper cutouts of enemies and fellow soldiers are amusing, and each course’s time period is reflected in the scenery. The interpretation of such historical figures as Michelangelo’s David are something to behold. On the audio side, the game’s epic music selections and laugh-out-loud sound effects make for a gratifying hybrid. 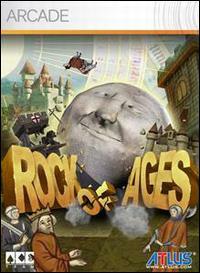 Rock of Ages is a charming title with a lot going for it. There are some minor quibbles, such as loose defensive controls and surprisingly long load times (for an arcade title), but this is still a lot of fun rolled into a bargain $10 price tag. I can’t wait to see what developer ACE Team comes out with next. I don’t tend to be a big fan of sports films (other than the brilliant “Slap Shot,” or “Remember The Titans”) but the trailer makes “Moneyball” look really interesting (this is despite that I tend to hate films that are supposedly based upon true stories that cast people that barely resemble, if at all, the actual persons (because there’s no way that the person that is being referenced in “Moneyball” looks like Brad Pitt. I understand that he produced the film, and he can get arses in the seats, but it still bugs me) the events happened to. Hey, thanks for stopping by! Moneyball is definitely worth seeing even if you aren’t a fan of sports films. I’m not sure if you liked The Social Network, but it has that type of vibe to it, and it works quite well for the subject matter. the image of the stone ball looks very special.